Competition has intensified even before TPG launches its mobile services on a commercial basis. TPG promises to offer senior citizens aged 65 and above 3GB of data and unlimited local calls free for the first 24 months. Circles.Life has also launched its new Flexi Plan which provides 1GB of data and 30 minutes of local talk time for free. Maintain MARKET WEIGHT. BUY Singtel for its defensive qualities. Upgrade StarHub to HOLD as valuation premium has vanished and, in fact, reversed slightly. Three is company, four is a crowd. TPG Telecom’s (TPG) network deployment has progressed smoothly and it is on track to launch commercial services in Singapore as the fourth mobile network operator (MNO) by end-18. Creating goodwill by charming senior citizens. TPG plans to offer senior citizens aged 65 and above 3GB of data and unlimited local calls free for the first 24 months. TPG says the attractive package for senior citizens demonstrates its commitment to Singapore's Smart Nation Initiative. This is just TPG's first initiative. CEO David Teoh promises there will be other exciting new offers for the public in the near future. TPG’s package for senior citizens signals its willingness to utilise low pricing as a lever to gain market share. On track to commence trial in Singapore. TPG disclosed during its 1HFY18 results briefing in Mar 18 that it has completed its data centre and core network in Singapore. A large number of base stations have been installed. TPG is on track to achieve the milestone of nationwide outdoor coverage by end-18. Trial to commence soon in Australia. TPG has launched unlimited data plan on a trial basis for free for the first six months. The first 1GB of data every day would be supplied at 4G LTE speeds, after which speed will be capped at 1Mbps for the remainder of the day. Customers who elect to continue with the plan after the 6-month free period will pay a subscription charge of A$9.99/month. TPG will be sending invitations to consumers who have expressed interest to participate in the trial, with priority given to existing TPG and iiNet’s fixed broadband customers. The trial is expected to commence in 2H18. Fighting to the bitter end. New entrants in the form of mobile virtual network operators (MVNO) have been trying to outdo one another in offering the most attractive service plans to consumers. Zero1. Zero1 will offer the first 3,000 pre-registering customers unlimited mobile data plan at S$19/month. The plan comes with 200 mins of local talk time and 200 SMS. Customers who signed up later have to pay subscription charge of S$29.99/month. The first 3GB of data would be supplied at 4G LTE speeds. Zero1 plans to differentiate itself by offering free voice roaming to call and receive calls from any Singapore mobile or landline number via its Zero1 app, which is scheduled to be launched in June. The feat is achieved using call-forwarding technology embedded in its Qongle device, which is sold separately at S$199. S$3/day for unlimited data on demand on any specific day. Customers can customise their plans in a granular manner by adding 1GB of data for S$8/month, 2GB of data for S$12/month and 30 minutes of local talk time for S$5/month. MyRepublic. MyRepublic will lease network capacity from StarHub to offer consumer mobile services. MyRepublic’s branding resonates with the tech-savvy youth segment. The MVNO better addresses adjacent market segments that complement StarHub’s focus on working professionals and enterprise customers. MyRepublic intends to cross-sell to its base of 70,000 fibre broadband subscribers. Details of MyRepublic’s service offerings are not available yet at the time of publication of this report. Counter attacking adds risks and uncertainties. MVNO could be a ploy to saturate the market ahead of TPG’s commercial launch. However, this strategy could backfire as MVNO could cannibalise incumbents’ existing customer base. We maintain our defensive stance on the telco sector as we brace ourselves for the impending entry of TPG as the fourth mobile operator. BUY Singtel (Target: S$4.22) due to its geographical diversification. 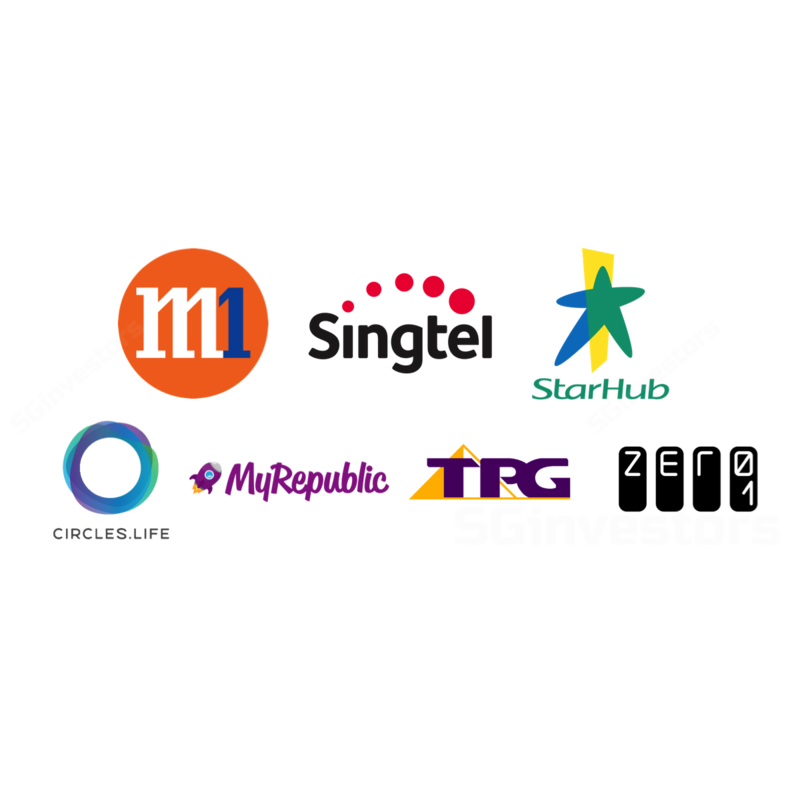 M1 and StarHub are vulnerable ahead of the commercial launch by TPG Telecom in 4Q18 due to their reliance on the Singapore market. Singtel provides a defensive shelter due to its geographical diversification. Its mobile business in Singapore accounts for only 7% of group revenue if we include its proportionate share of associates’ revenue. Maintain SELL. M1’s share price has corrected only 5.6% ytd. The stock is vulnerable as its mobile business in Singapore accounted for a whopping 76.3% of service revenue in 4Q17. Our target price of S$1.60 is based on DCF (COE: 8.5%, terminal growth: 1.0%). Upgrade to HOLD. StarHub’s share price has corrected 35.4% ytd. Its premium valuation, which we previously barked at, has vanished and, in fact, reversed slightly. Its mobile business in Singapore accounted for 52.6% of service revenue in 1Q18. Our new target price of S$1.98 is based on DCF (COE: 9.0% and terminal growth: 1.0%). Suggested entry price is S$1.72. Impending entry of TPG Telecom as the fourth mobile operator in 4Q18. Our earnings forecasts are largely unchanged as they are already at the low end of consensus estimates. Competition and pricing erosion worsening more than expected post entry of TPG. M1 and StarHub not closing the deal or achieving the desired cost savings from network aring.